Smile, Nigeria’s superfast, super-reliable and high-quality 4G LTE provider, has unveiled a brand campaign, in the spirit of the holiday season to keep families and friends connected, entertained with music and videos and updated with what's happening on social media. 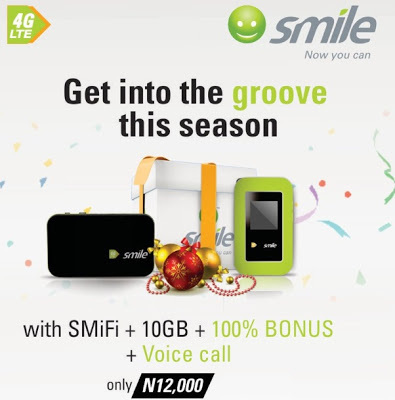 The campaign tagged, ‘Get into the groove this season’ is aimed at empowering individuals and families to purchase and use Smile’s affordable 4GLTE broadband internet to enjoy their smart TVs, portable tablets as well as voice and video calls. Stay connected to the people and activities they love doing online, watch videos, play games and more. With the campaign, potential customers will enjoy the offer by purchasing a SMiFi device for only N12, 000. The SMiFi device comes bundled with 10GB data in addition to FREE 1 hour YouTube access daily for 1 month, 10 minutes call all local networks, 100 percent data bonus for first 3 months and unlimited on-net calls. The FREE 1 hour YouTube access is available for use between 9am – 3pm daily within the 30days period. Existing customers on the network will also enjoy the FREE 1-hour YouTube offer for 30days period by purchasing any 30 days Anytime data plan with a minimum of 5GB.